Unfortunately, that was a mistake, because there was road construction on the route, and our GPS tried to lead us astray. I got this GPS free with the purchase of four new tires, and it shows. We didn’t have a name for her for the first day, because I said I needed to experience her personality before I named her. Well, she is now named General Custer. She is pretty bossy and and doesn’t always know what she is doing, and she may just get us all killed. The first route she told us to take to the golf course led into a gravel pit. Eventually, we got back on the highway, had to go past the golf course and come back the opposite direction because of road construction. Now, I can understand her not knowing about the road construction, but the gravel pit adventure was a little excessive. So you just have to remember to take everything she says with a big grain of salt. She did get me to the places I wanted to go pretty successfully the rest of the day, although I was on my own once I got within a mile of the golf course again. She also thinks our hotel is about 1/4 mile from where it really is. 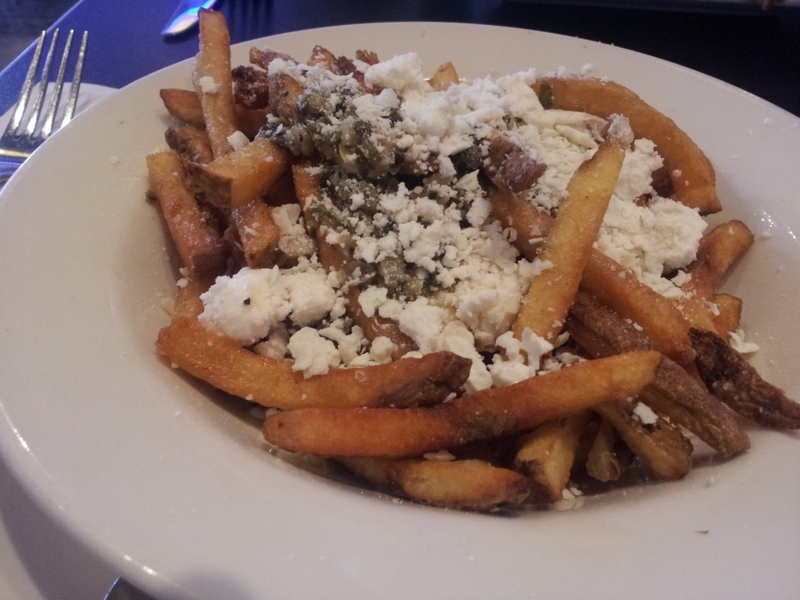 After dropping Ken off, I headed out for the Santa Fe Baking Company. My friend K. from college STRONGLY RECOMMENDED visiting there and I am glad to go anywhere that has baking in the title. It is really a fun little place, lots of character. I would gladly go back. 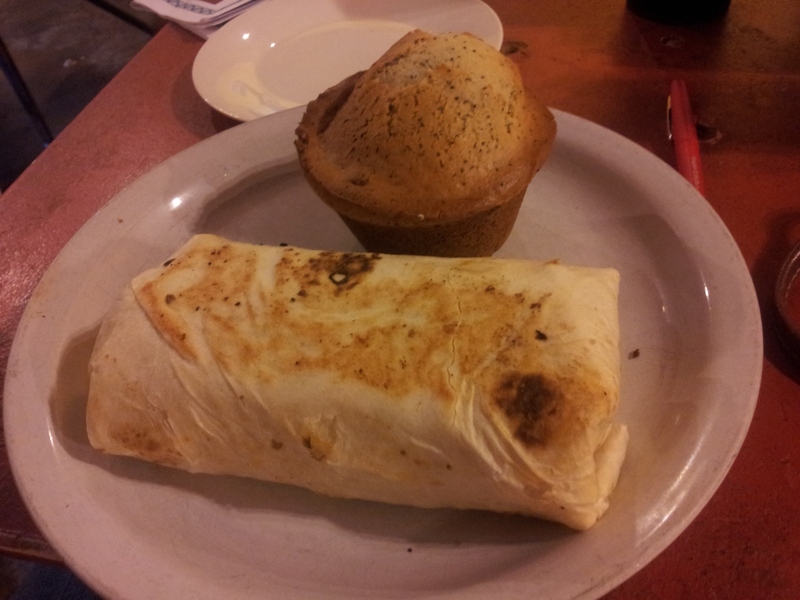 The breakfast burrito with turkey sausage and green chile was good and so was the poppyseed muffin, but they had a whole case of amazing looking baked goods I would like to try. And it was a great location, because just down the parking lot was a Trader Joe’s, and about 1/4 mile away was Looking Glass Yarn. 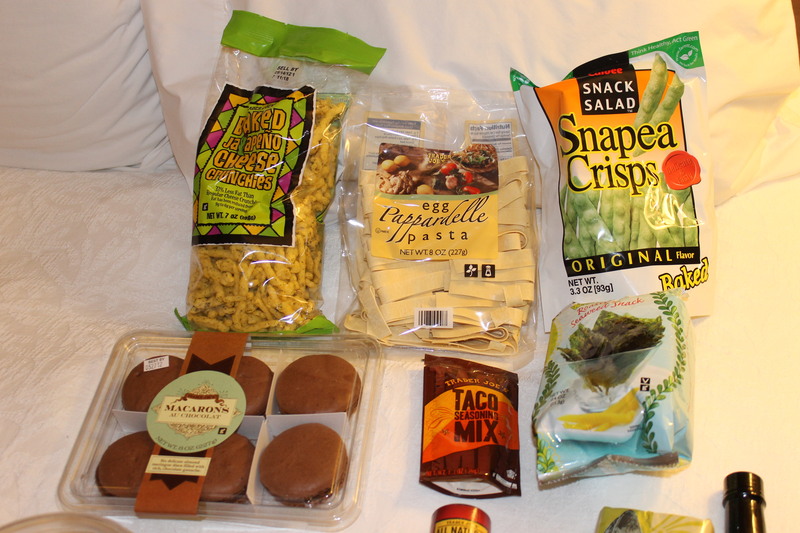 Jalapeno cheese crunchers, pasta, snap pea crisps (have already tried these, excellent), chocolate macarons (also excellent), taco seasoning, crispy wasabi seaweed snacks (not as good as the peas or beans, which are below). 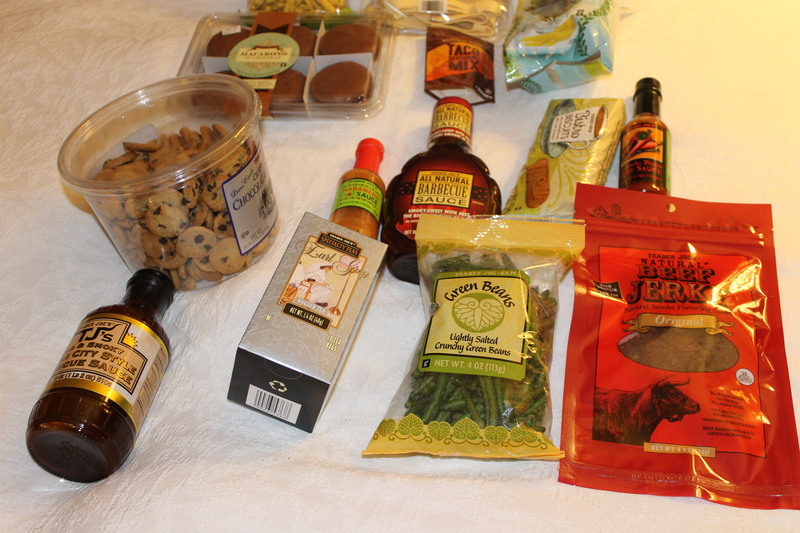 Chocolate chip cookies for Ken, hot sauce, BBQ sauce, biscoff-type cookies, more hot sauce, more BBQ sauce, Earl Grey tea, crispy green beans (OH SWEET MOSES ON A CRACKER, THESE ARE GOOD) and jerky for Ken. I did not get any two-buck Chuck wine, I still have some left from Christmas and I only have so much space in my wine cupboard. I walked back to the car, noticing that it was still very smoky, and you could smell it as well as see it, from the fires in western NM. I deposited the Trader Joe’s stuff, and headed to Looking Glass Yarns. My friend K. from Knit Knight said they were the place to go, especially since they carry her Yarn Lover’s Lotion. Well, I went a little nuts in there. 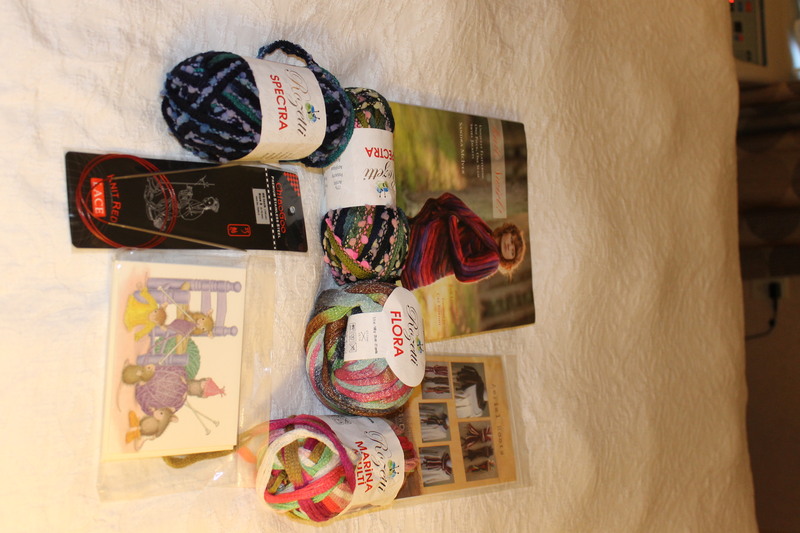 I needed some needles for my Yarn Camp project, and I got those, but she also had a really cool sample sweater from the book “”, so I had to buy the book (I did not buy yarn and needles so I could cast on a sweater, so I did show some restraint.) I bought something that I will put in with my exchange gift at our Knit Knight Christmas party. I had been looking at all the cool novelty yarn scarves that are out right now, and I decided to go ahead and buy some of that yarn. All in all, a very good time was had. 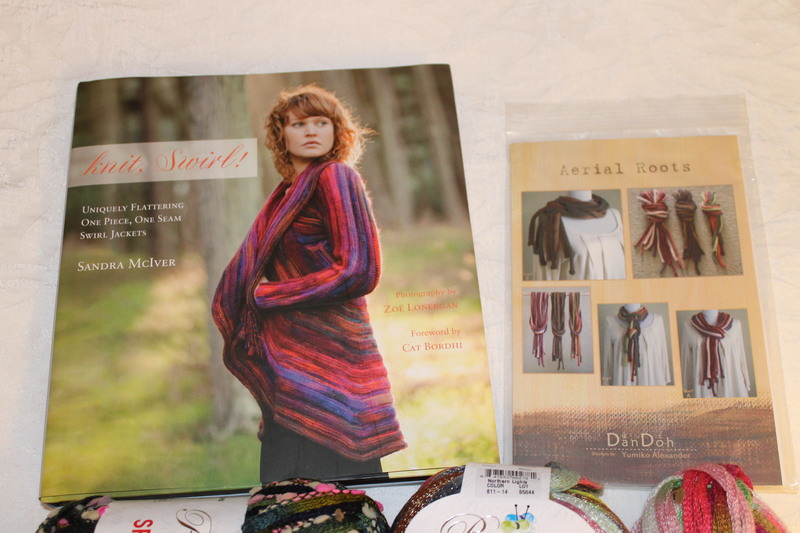 The lady operating the store was very nice and friendly, fun to visit with, and very helpful with picking out yarn. By this time, it was 11:00 and I thought I better head for the Georgia O’Keeffe museum before I ran out of time to see it properly. General Custer GPS and I made it there OK, but General Custer can’t suggest parking spots. There was a Porshe festival going on in the Plaza, and so there were streets blocked off and I had to drive around quite a bit before I ran into the municipal parking lot, which was about five blocks away from the O’Keeffe museum, not a bad walk at all. The museum isn’t huge, and it rotates the art on display from its collection, so you are only seeing part of the collection. I don’t think I had ever seen any of her art in person before. She was versatile. There were rough pencil sketches as well as pastels and oils on display, as well as some of the items she had used in life. They had a display of camping equipment she used to go out and camp, close to the paintings she had created from that experience. The two short films about her life made me want to get one of her biographies from the library, as well as more information on her painting. 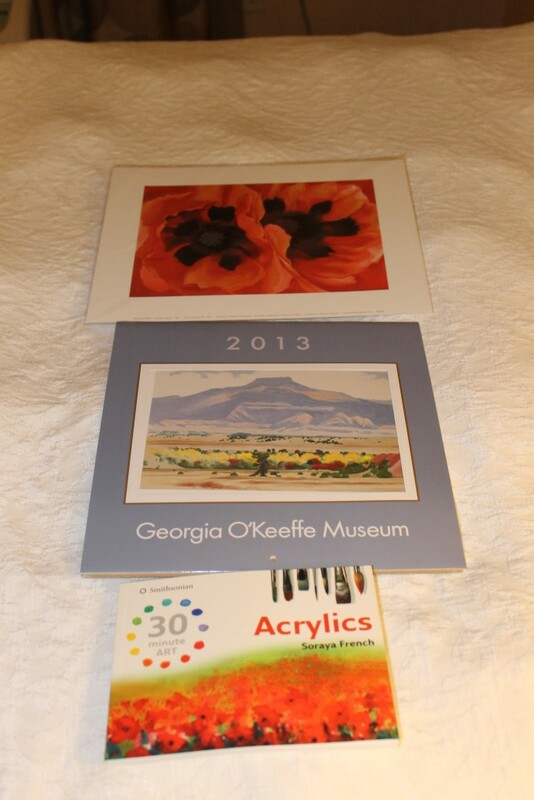 Of course I went to the gift shop, going home with a 2013 calendar with her paintings, a book on 30-minute art with acrylic painting (haven’t ventured into that yet but I plan to, and art books are also helpful in my quilting class), and a print of one of her poppy paintings. 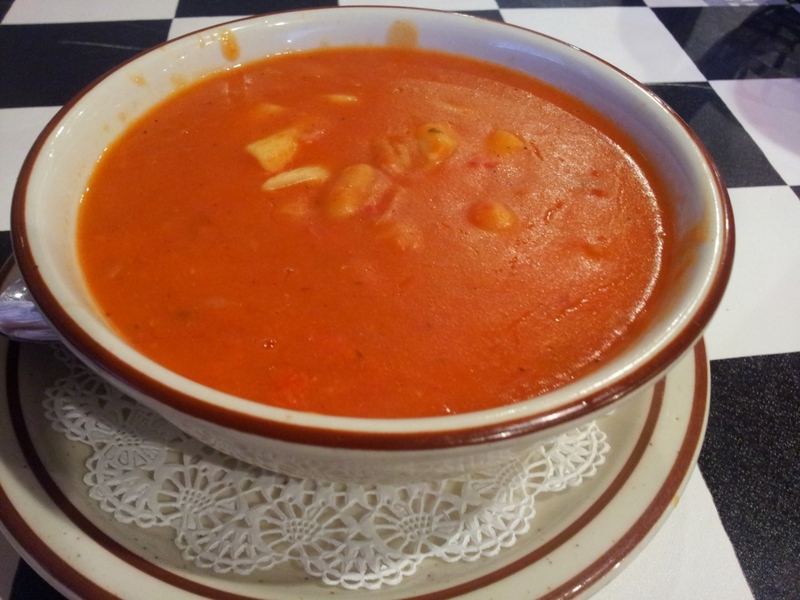 I still had some time before I thought Ken would call from the golf course so I stopped at The Chile Shop. We had looked in the night before but it was closed already. I was curious about getting a ristra (the long string of dried red chiles) to cook with, and I know that some of them sold in some of the shops are just for decoration, and are coated with shellac or insect repellant to make them last longer. So I really wanted to stop in a store that was more oriented toward cooking with them. Well, this was the place. However, when I reviewed the size considerations, I decided a ristra might not be for me or my kitchen – the proprietor said they are usually 24 inches long but the farmer has been making them longer and they are about 30 inches long (must have been a good year for chiles) and he would pack it in a big box for me, but then I thought, “Where would I put this in my kitchen?” He did not have any small packages of those particular New Mexico chiles. 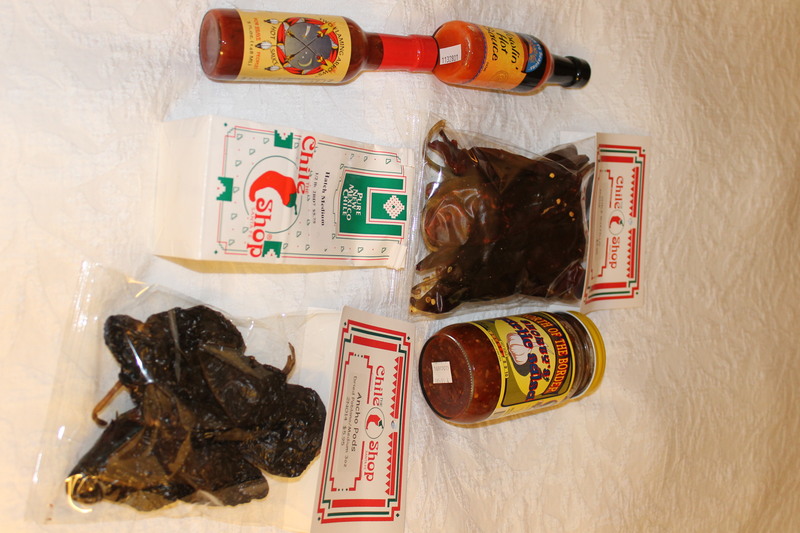 But I bought a couple of packages of other kinds of dried chiles, and some chile powder (mild, so I can use it in the chili both Ken and I eat), and some locally made salsa and hot sauce. I had just gone back to the car to drop off my parcels, and Ken called to say he was done golfing, so General Custer and I made our way back to the golf course. At least she doesn’t get too annoyed when you don’t follow her directions. We went back to the hotel and cleaned up before going to lunch. My knitting friend K had also recommended we go to the Plaza Cafe to eat, but it was closed for renovations after a fire. 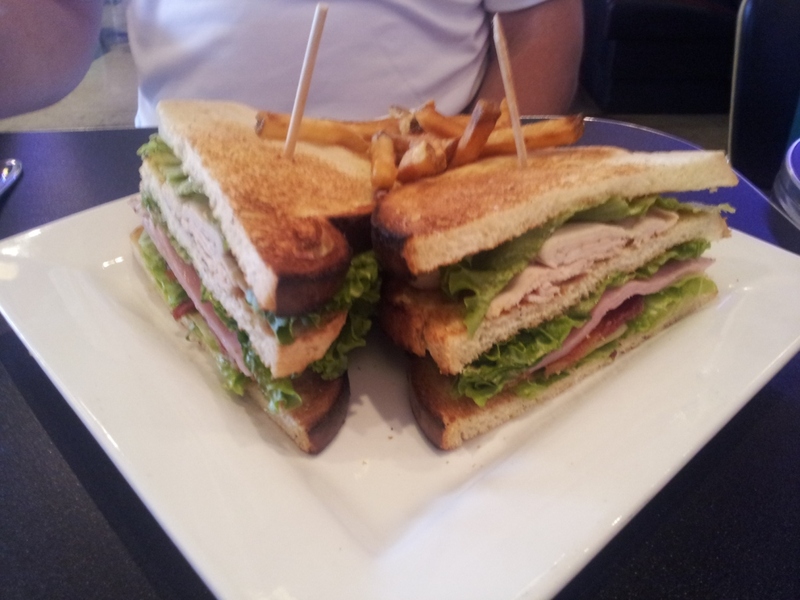 However, there is also a Plaza Cafe Southside, which was just blocks from our hotel. Off we went for lunch. Ken had the club sandwich, and with my usual lack of decision and indifference to eating in one ethnicity or style at a time, I had 3 appetizer-style things: tomato-orzo soup, Greek fries (french fries with olive oil, mizratha cheese, capers, other greek seasonings), and salmon ceviche two ways – with citrus and with coconut milk. They were all excellent but I should have chosen two rather than three. 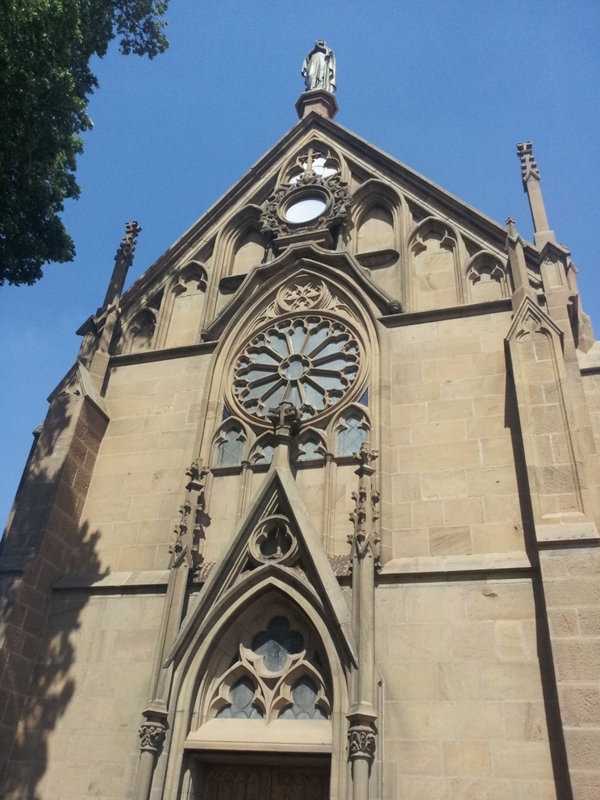 By this time it was 3:00, and we wanted to get downtown and tour the Loretto chapel before it closed. The chapel used to be connected to a Catholic girls’ school, but the school had closed and the Diocese did not want to buy the property, so it was purchased by a private owner and opened as a historical museum. 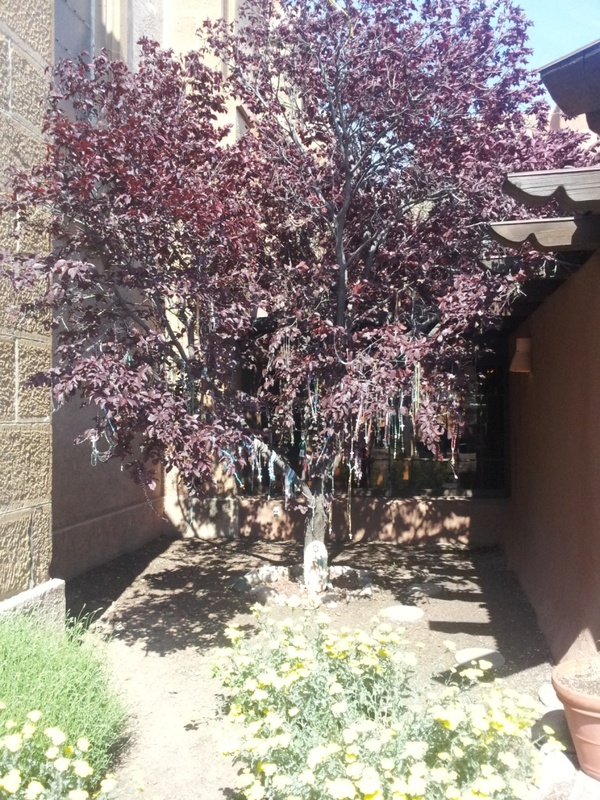 This is a cool tree outside where people hang rosaries. 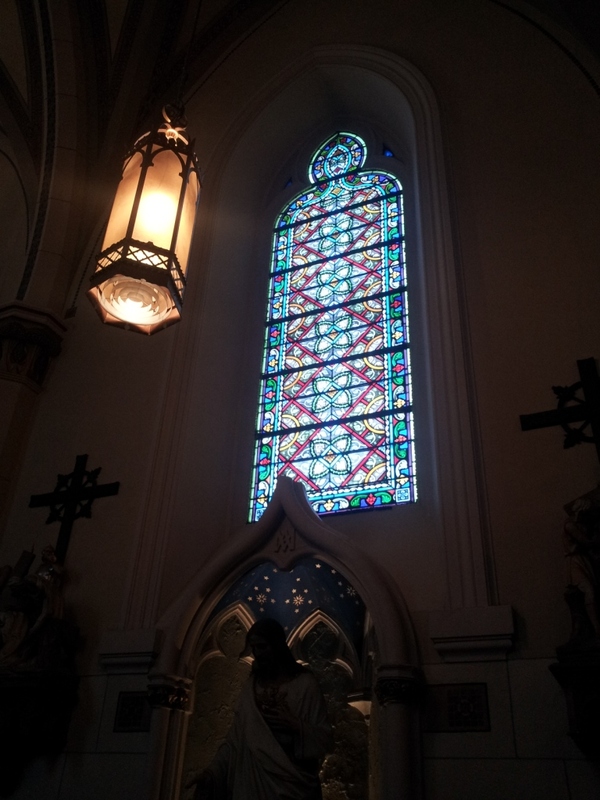 Beautiful stained glass and altar. 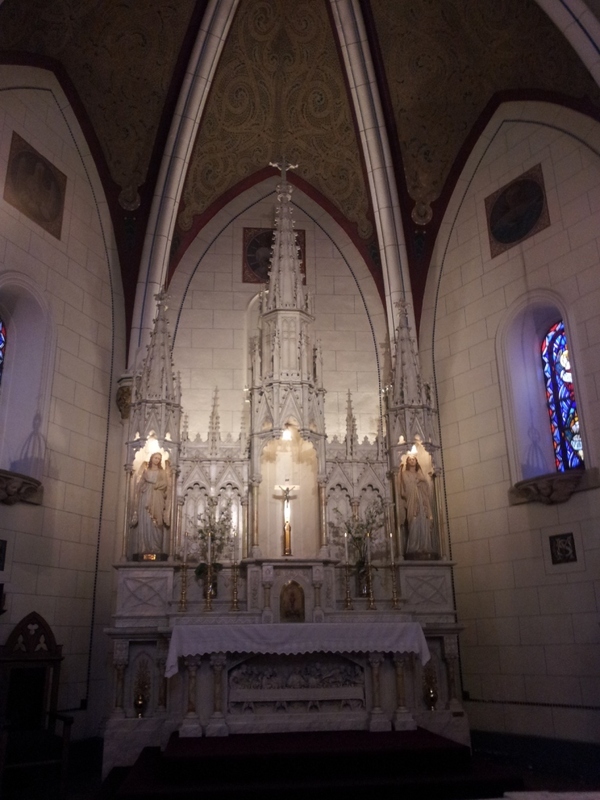 It is no longer a consecrated Catholic church, but weddings and “other appropriate events” are held here for a fee. 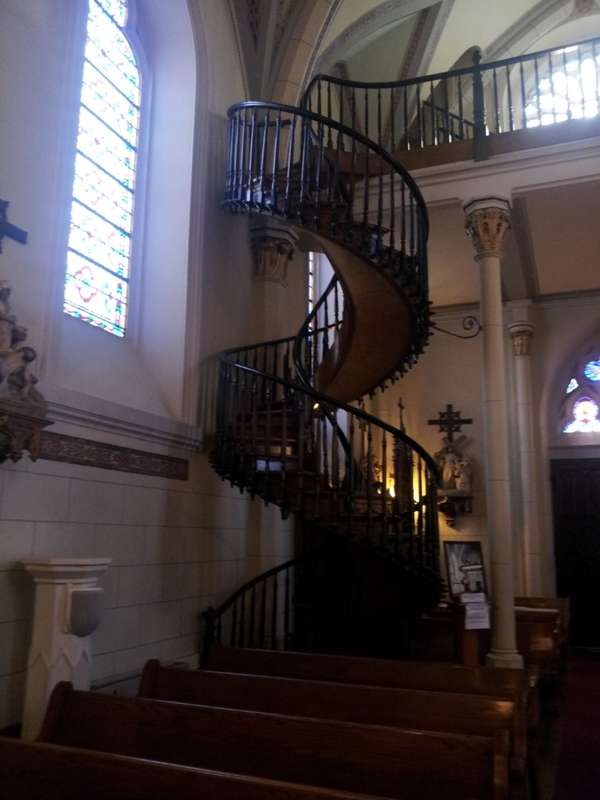 The interesting thing about the chapel is the spiral staircase that goes to the choir loft. It is made entirely of wood, with no nails or screws, and no supports. It makes two complete 360-degree turns, and didn’t have a banister until one was built later because going up the staircase was freaking out the nuns and students. The carpenter who built it appeared and made the staircase and left again without payment or leaving his name. It is a beautiful chapel, and the staircase is amazing. You do not get to walk on the staircase unless you have paid to have your wedding there, however. I forgot the good camera, so these pictures were with my phone. Then we took off to do some souvenir shopping. We ended up buying the most in the first store we had been to, it always seems to work out that way. 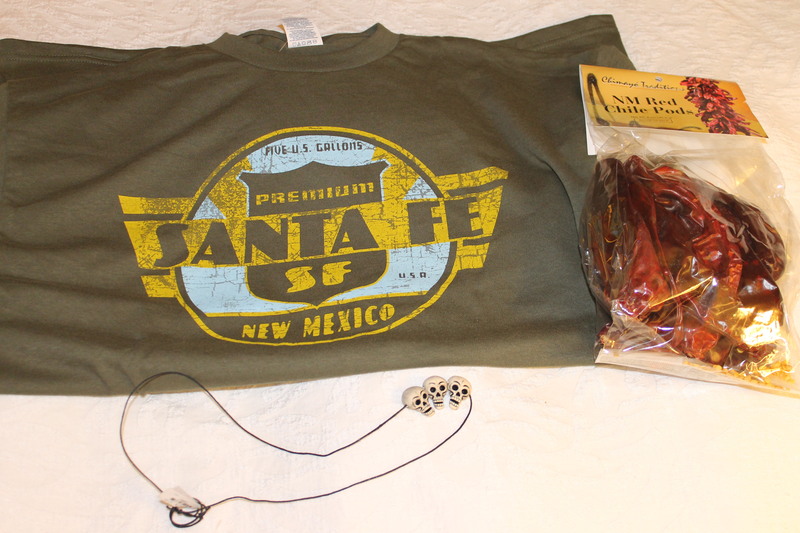 We stopped at one western-themed store (YIPPEE YI YO) and got Ken got a T-shirt, and I got a small package of dried New Mexico chiles (victory! He didn’t have this type at The Chile Shop), and a skull necklace to hang from my car mirror (I have an interesting collection of items on there.) They also had a lovely child’s play set called “Thirsty Cowboy” which featured a pistol in a holster and a flask, totally non-PC, which we did NOT purchase. We then asked him if there were any stores in the area that would have glow-in-the dark Virgin Marys. (Various objects with saints on them are quite common in Santa Fe gift stores, but not luminescent ones) He sent us to Doodlets. This store kept us busy for quite a while. It was full of fun stuff for Day of the Dead, party stuff, rubber chickens, inflatable fruitcakes and turkeys, etc. 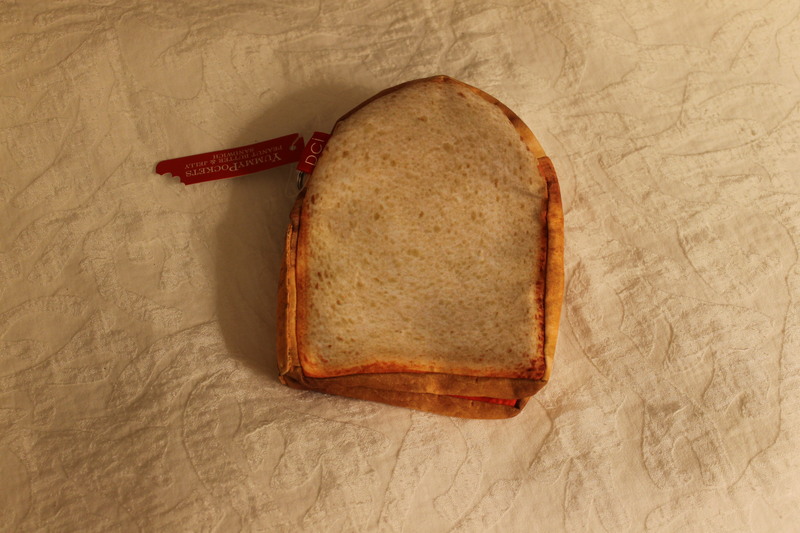 I got a small coin purse that looks like a peanut butter sandwich – the two pieces of bread click together with a magnet, and the zip open at the top. 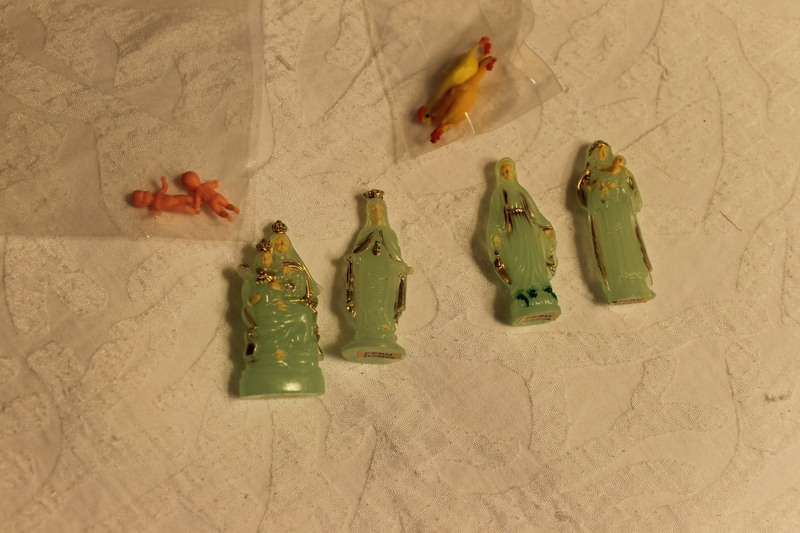 They had small glow in the dark saints, so I got 4 versions of Mary, plus two miniature rubber chickens and two plastic babies. I have no idea what I am going to do with those but it will be something creative. Back at the 1st store (Dressman’s Gifts, on the Plaza), we got some fun key chains for Ken’s co-workers, a t-shirt for me, and folk art sheep to join the folk art cats from Haiti on the shelf, and a Dios las Muertos (Day of the Dead) magnet. The magnet is ON the shirt in the picture below. Then we headed back to the hotel to debate where to go for dinner. 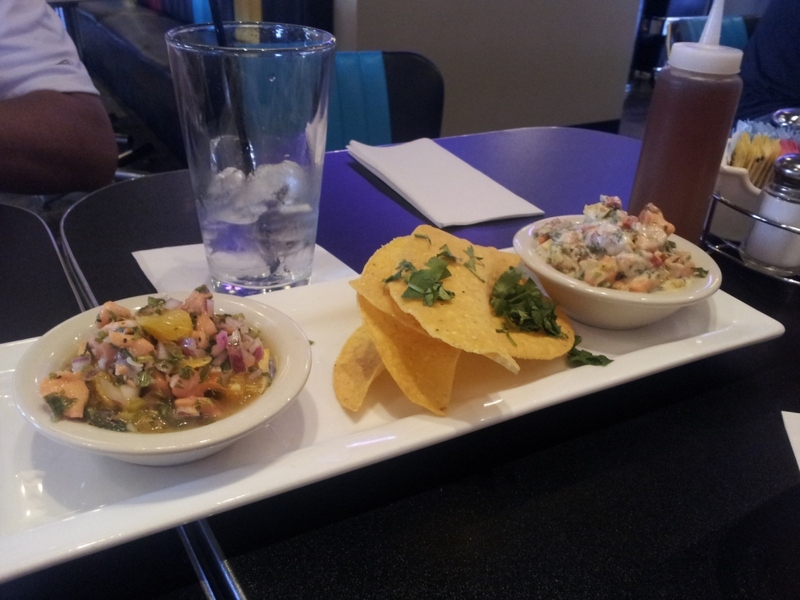 We needed a break from Mexican food, so I was thinking noodles. There was a really good noodle house not far away, but there was nothing on the menu Ken would have eaten. He suggested Italian noodles, so I found a place close to the hotel via Yelp that people either seemed to love or hate. It was called Piccolino’s, and it was a total local joint – people were coming over to each other tables and visiting with each other, and there seemed to be a large number of locals. 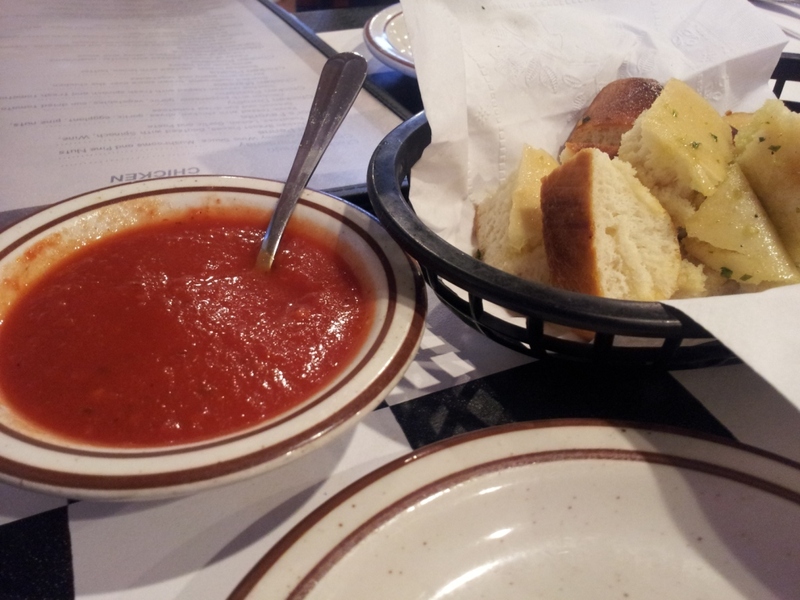 Appetizer of bread and marinara. 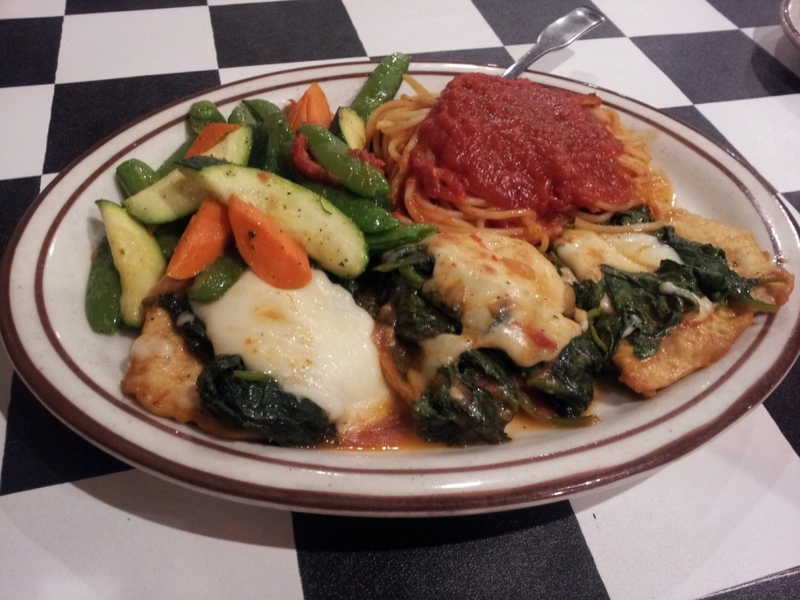 I had a bowl of the pasta fagioli soup, and the stuffed eggplant parmesan and Ken had the Chicken Florentine, which shocked me, because it had spinach on it. 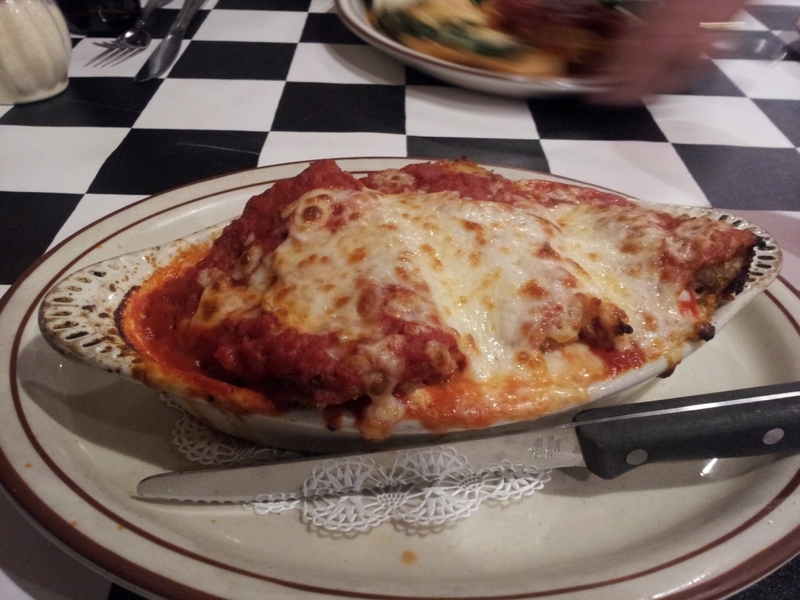 My soup was good but the eggplant parmesan mostly tasted of the breading. It had a lot of cheese (rolled up in the slices) and was then covered with red sauce and baked. 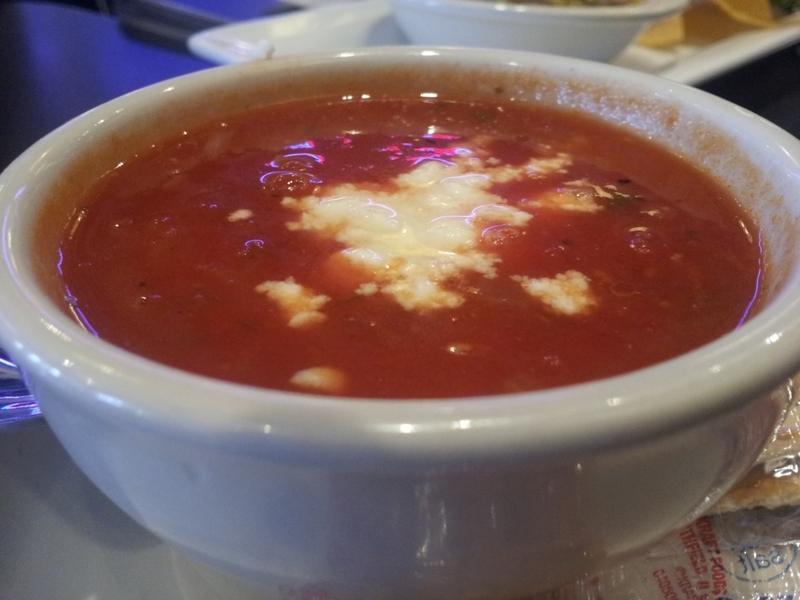 The red sauce was very good, it was just that the eggplant taste didn’t come through at all. Ken was happy with his. This is the kind of place I would gladly keep coming back to until I found something I liked, just because of the atmosphere. And then we went back to the hotel and I worked on my blog and Ken watched the news and we crashed! 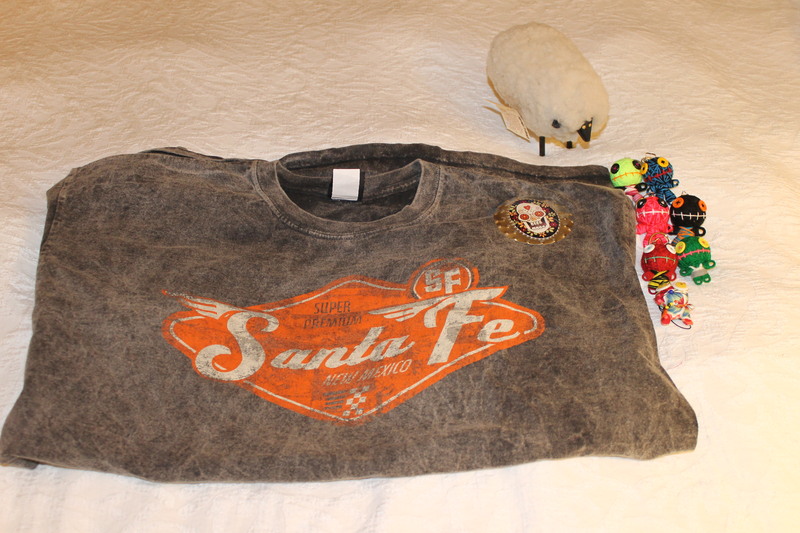 This entry was posted in Art, Knitting, Restaurant reviews, Santa Fe Trip Report and tagged Food, knitting, New Mexico Travel, travel by glenderella. Bookmark the permalink. These are great photos, not only of the food but architecture as well!